This time of the year, there are many people working on their new year’s resolutions. One of those resolutions is to get fit and toned. In this week’s blog we are going to consider the importance of good posture and muscle control for exercise. The way we hold ourselves and the level of tension we exert on our muscles has a positive or negative effect on our body. If we are mindful of our posture and how we move our body, we find we can reduce unnecessary pressure and strain on ourselves. However there are some people that don’t view posture as an important factor. However our amazing body is designed with pulleys and levers, (in the form of muscles) to work efficiently. It cannot do this so effectively if our posture is compromised. Posture is affected by the level of tension set within the muscles. If you are a regular reader to my blogs or have joined my online program, you will know that I often refer to subcortical or subconscious muscle contractions. This type of muscle contraction is happening without our awareness. It happens automatically, without us knowing. Throughout your day, sensors within your muscles are detecting changes in your fibres. If a certain posture is held for long enough, the muscle to brain communication thinks this is ‘the new normal’ and as a result becomes the person’s new posture. The body and brain adapt to habitual behaviours, movements and postures. So if you slump over a computer during your work hours and do not self correct or self adjust with pandiculation, your muscles and brain will continue to hold this posture. Likewise if your posture is prone to developing a sway back with very rigid shoulders, your brain will think holding large amounts of tension in your lower back is normal. However, these two postures create too much pressure on muscles, tendons, joints and ligaments because they are passed neutral. I have used these images in previous blogs and I will refer to them again today. Let’s consider the two postures which are often seen in society today. Let’s consider how subconscious muscle contraction and by extension, poor posture can impact on exercise by considering the two postures above. If you are prone to slumping forward, which muscles would you say are tight? Muscles such as your abdominals, hip flexors, chest muscles, muscles through the front of your neck, glutes, quads and the list goes on. If they are subconsciously tight, they are being told by the brain to hold these muscle fibres in a permanently contracted state. Then when you start exercising, you are already starting with muscles shortened. You may say that your stretch before exercise. However sports science experts have shown that stretching before exercise actually poses no beneficial changes or shifts within the body. You may know this and so opt for warming up slowing. This is a sensible option, as we allow blood to pump into the muscles and prime the region for exercise. However if the muscles are being held tight by the brain, only the brain will release the contraction, no amount of stretching, pulling, tugging or twisting will change the muscle length, unless we change the software message (brain communication) to the muscles. Are you really in control of your muscles? Let’s consider some of your muscles are subconsciously/subcortically contracted by 20%. This means you only have 80% range within that muscle. So when you start exercising and strengthening muscles, you only have 80% of your muscle under your conscious control. Over time with habitual postures, movements and behaviours, your muscles may tighten by another 5% or 10%. Unless you know how to fully release a subconscious muscle contraction, you will find you will get tighter and tighter. As a result the amount of range and activity you can do is limited. You may suffer with back and hip pain. A health professional may then inform you that you have a ‘weak core’ from your bad back and encourage you to join classes to strengthen your core. For some people this can help, however for many, it is purely amplifying their pain and intensifying their subcortical muscle contraction. As a result, the centre of their body (abdominals and lower back) become tighter and they move with more rigidity because they have created co contraction, where the muscles are tight through both the front and back of their body. Their muscles have forgotten how to coordinate with movement. This coordination is paramount to healthy movement. To highlight this fact, as you read this blog, could you contract your bicep? Notice what happens when you tighten your bicep, your tricep on the other side of your arm has to release and lengthen to allow that movement to happen. Imagine if your tricep would not release, what would happen? You would have an arm which has an internal ‘tug of war’ going on between the bicep and tricep. Neither wants to release. Take that image to your lower back and abdominals. Have you ever tried to bend down to lift something up and due to the tightness in your lower back, found alternative ways to do it? When the abdominals and lower back are communicating efficiently, they know that as you lean forward to lift something up, your abdominal muscles shorten as your lower back muscles lengthen. Then when you stand up right, the abdominals will release from their contraction as the lower back muscles return to neutral. So in this situation, before we strengthen muscles, we need to re educate our muscles and teach them how to synchronise their movements so that when we exercise or enjoy strength training, the sequencing from the muscles to the brain is correct. When we pandiculate before and after exercise, we also return the muscle back to 0%. So we are able to use 100% of the muscle, which is better efficiency on the muscles, tendons, ligaments and joints. Pandiculation is the process which changes the brain to muscle connection by ‘waking up’ areas within the sensory motor cortex (brain map) which until pandiculation had been subcortically or subconsciously contracted. A software update (brain to muscle) in the form of pandiculation teaches the sensors within the muscles where 0% actually is. Let’s consider the second posture. If you are prone to having a sway back, your bottom sticks out, your belly protrudes and your shoulders are set back, your brain is creating subconscious muscle contractions through the back of your body. This affects your neck and jaw, shoulders, lumbar spine which can lead to herniated discs, very tight glutes which can create sciatica, hamstrings, calf muscles and feet. Holding large amounts of tension through the back of your body has been created by the tilt in your pelvis, caused by the lumbar muscles tightening in to what looks similar to an archer’s bow. As a result, more weight is transferred through the back of your body, rather than keeping your weight transfer neutral. This uneven weight transfer causes plantar fasciitis, hamstring issues, calf muscle complaints, and back pain. You can often hear a person with this posture before you see them because they strike the floor very heavy through their heels, creating further pressure for their already tight lower back muscles. Once again a person with this posture is often plagued with many muscular issues which often create lower back pain. Again in my clinical practice I have heard clients inform me that they have been advised to strengthen their core to deal with their lower back. However when they tighten their abdominals, what do you think occurs? Co contraction! The lower back muscles were already subcortically contracted and pulling the pelvis out of neutral. So by strengthening the core, the front of the body has now become tight and creating a ‘tug or war’ between the front and back of the body. This leaves very little free movement because the coordination and synchronicity has stopped working efficiently. This is usually when I see clients because by this point, in their own words, “I have tried everything!” When they are educated about how their muscles work and how movement should occur, I can see they are starting to truly understand how their body works, rather than being told that X, Y and Z is wrong with them. When clients are educated and empowered in the area of their own health and well being, they feel they can make changes and progress. 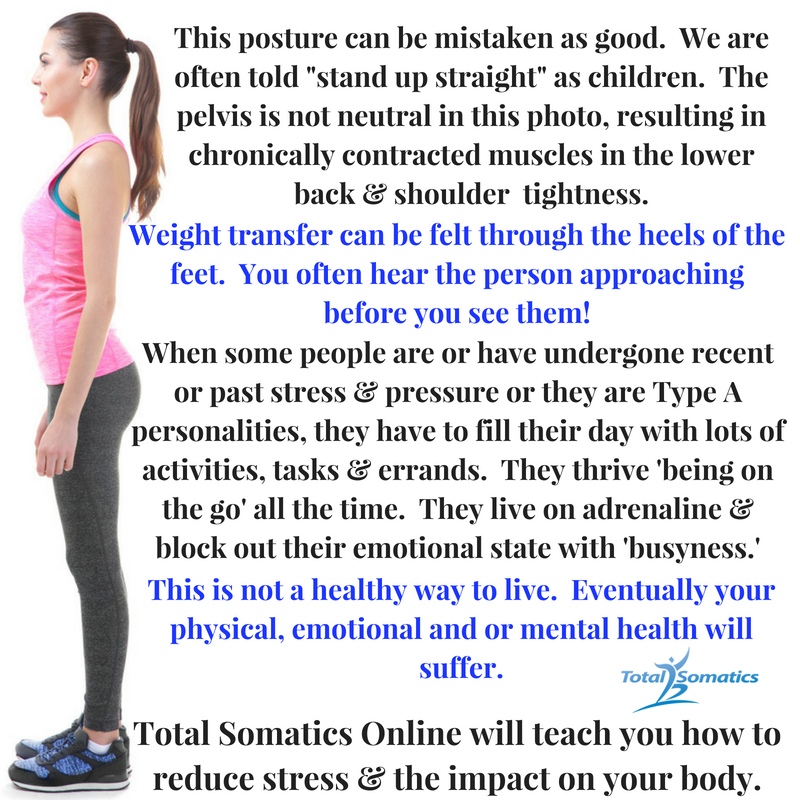 That is why I created The Total Somatics Approach to Health & Wellness online program at www.TotalSomatics.com. Clients from within my clinic and people from around the world have access to my program. It allows you to learn how and why your body operates the way it does. You learn about somatic movement, mindset, mindfulness and nutrition. Many have found the movements within the program helpful for resetting their muscle length after exercise or strength training. Others have found it has eased their pain, improved their posture, increased mobility and allowed them to return to the activities they love to do. Check out this testimonial from a client who realised when we work with pain and tight muscles, it is more than just looking at one area…. Many physios have commented to me after seeing me for a clinical appointment or in class, it is the missing link for rehabilitation and general musculoskeletal health. Before you start strengthening a muscle, you have to break the ‘autopilot’ actions of subcortically tight muscles. Until you have full conscious control of muscles, you will only be operating on a smaller percentage of your muscles, which in turn will cause our body to adapt and create compensatory patterns or postures to cope with the limited range within the muscles. Would you like to learn how to release chronically tight muscles, improve posture, reduce pain, enhance performance in your chosen sport/activity or return to the activities you love to do? 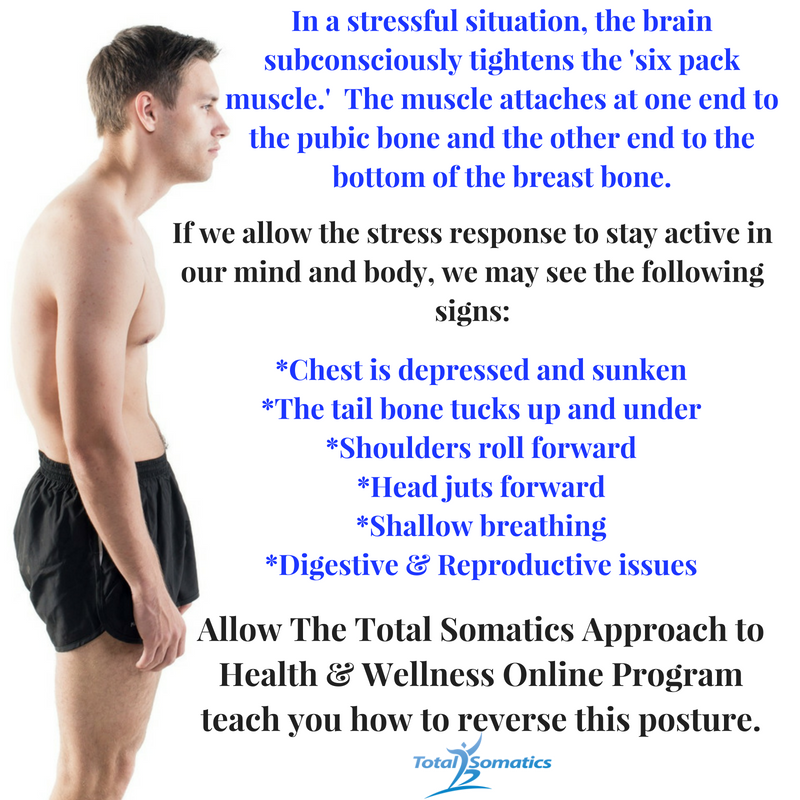 The Total Somatics Approach to Health & Wellness online Program has been designed to complement your lifestyle. You will actually notice within a short amount of time that your awareness changes due to the knowledge and skills acquired from the podcasts, videos, audios, support material and somatic movements you learn within the online program. New material has just been added within the last 2 weeks and more will be uploaded within the next two weeks. So if you are already using the online program, check out the new podcasts, support material and audios within part 2, week 5-12. I look forward to teaching you these brilliant skills which will enhance your health and well being. October 11, 2017 By Heidi Hadley Blog free from pain, intercostal muscles, mindfulness, muscle pain, muscle strain, somatic breathing Comments Off on What can you do to release muscle tightness and discomfort around your ribcage?